Her sword in a high guard (what the old woman who taught her to fight called the Horn of the Bull), Angela advances deeper into the tunnel. She steps lightly, but does not worry overly much about remaining silent. For one thing, the iron scales sewed to her leather tunic clink and rattle with her every movement. For another, the beast she is hunting appears able to hear the slightest sound. For a third, she wants the creature to know she is coming. At least, she thinks she does. Magda, who began her training with a pair of hardwood sticks, used to ask her, “When are you most vulnerable in a fight?” It did not take long for her to demonstrate the answer: when you are attacking. Then, you’ve committed yourself to whatever strike you are going to use against your opponent, and in so doing, exposed yourself to her counter—provided, that is, she is possessed of sufficient speed and knowledge. The lesson has served Angela well in more than one confrontation, and she has hopes it will once again. If she can provoke the beast to a charge, she will sidestep and bring her sword down on its skull. As it so often does, her sword, Deus ex Machina, has an opinion on the matter. Wouldn’t a trap be a more sensible plan? She doesn’t hears its low, pleasant tones so much as she does feel them, a tremor that starts in the weapon’s hilt and travels through the network of her bones to finish within her skull. Aside from its voice, and the intelligence behind it, there is nothing remarkable about the blade. It is a longsword, much as she trained with, its guard simple, its hilt wound in leather to improve the grip. A regiment of the King’s finest cavalry, the sword says, armed with their longest and sharpest lances. They lay in wait while the beast is lured from hiding. Once it’s in the open, they surround and skewer it. Should you fail, he may have no choice. 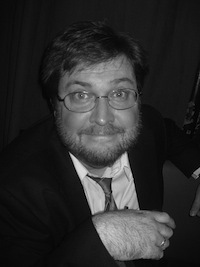 John Langan is the author of two collections of stories, The Wide, Carnivorous Sky and Other Monstrous Geographies (2013) and Mr. Gaunt and Other Uneasy Encounters (2008), and a novel, House of Windows (2009). With Paul Tremblay, he has co-edited Creatures: Thirty Years of Monsters (2011). Forthcoming is a new collection, Sefira and Other Betrayals, in 2016. He is one of the founders of the Shirley Jackson Awards, for which he served as a juror during its first three years. He teaches classes in creative writing and Gothic literature at SUNY New Paltz. He lives in upstate New York with his wife, younger son, a trio of ambitious dogs, and a trio of suspicious cats. His newest novel, The Fisherman, comes out June 30th.